In 1955, the great scientist Albert Einstein died in Princetonhis express wish was that his body be cremated, so as to leave no earthly remains. But, on the day of his death, his brain was secretly removed by doctors at Princeton Hospitalsupposedly for scientific study. Nearly 40 years later, no study is complete, and there are only rumors as to whereabouts of the missing brain. . . . 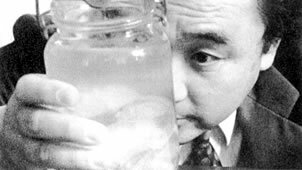 This film follows the quest of an Einstein expert, Professor Sugimoto Kenji, who travelled from his home in Japan to the USA to try and find the greatest relic of 20th century science.